Giesecke & Devrient GmbH prints banknotes and securities. The company offers end-to-end mobile security solutions comprising hardware, software, and services for banks, network operators, public transportation providers, and other companies. The company serves various markets and industries, including banknote and security paper mills, banknote and security printers, cash in transit, casinos, central banks, commercial banks, enterprises and OEMs, government, healthcare, mobile network operators, pharma, public transport, retailers, and system integrators. 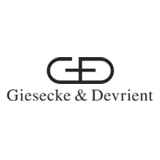 Giesecke & Devrient GmbH was founded in 1852 and is headquartered in Munich, Germany.